So in our new bedroom we've got this little nook that I want to use as my office. Where I can blog and design. 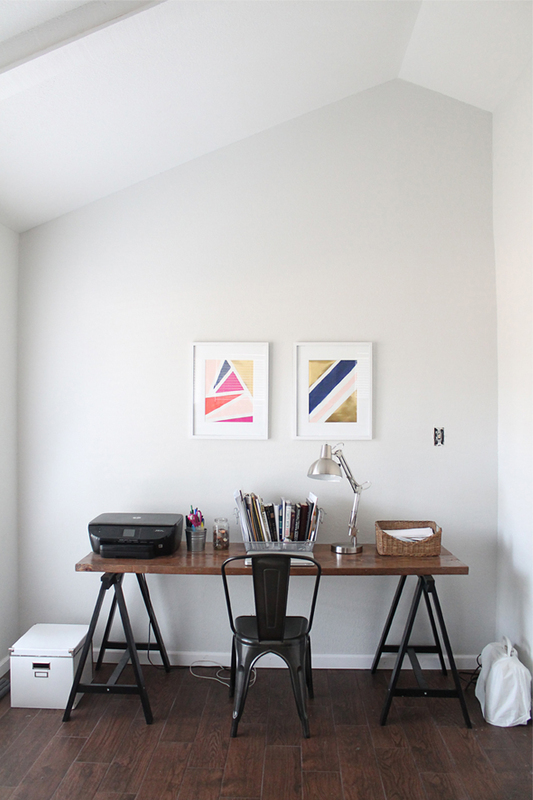 We made a desk using IKEA trestles and two boards from our previous dining table. I found the chair at Ross one day and my office looked a little more like an office except for the bare wall. I thought about doing shelves but I love simple design so I brought over two frames I had originally bought for our living room and searched for some art I could DIY because 11x14 art isn't cheap and I am cheap thrifty. 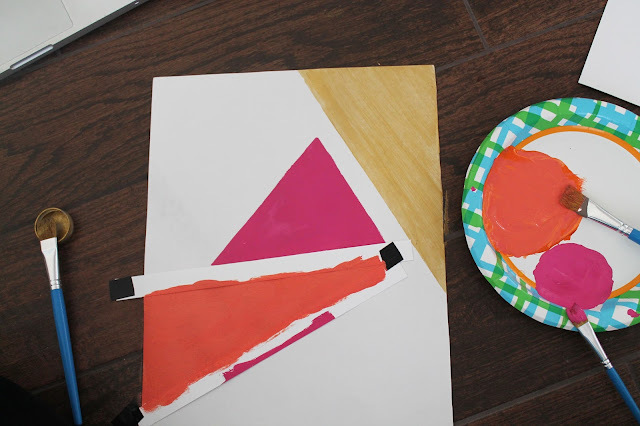 I found this geometric art tutorial from Shop Sweet Things and decided to give it a try. Except I couldn't use tape because I used a poster board instead of a canvas so I could frame it. I ended up improvising and cut out strips of another poster board and taped those together in place of tape. I LOVED the colors they used but I didn't have the exact shades in my acrylic paint stash so I did a little mixing to create my own. 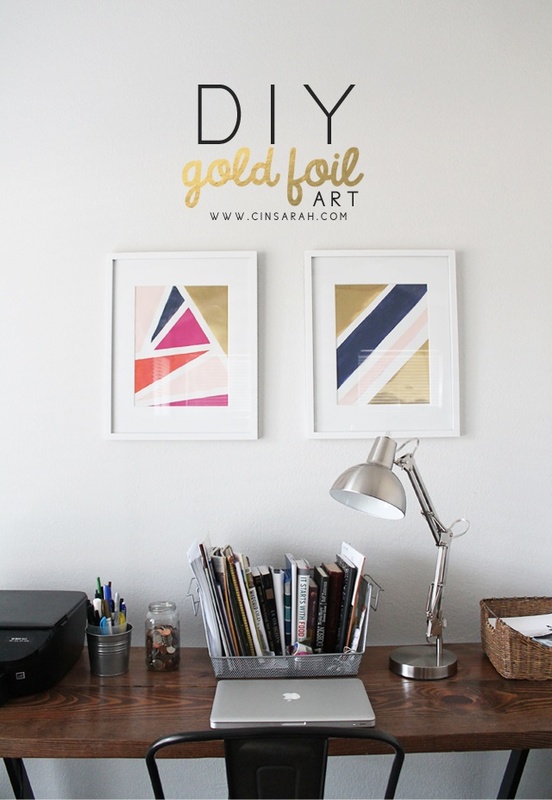 I started off using gold paint but during a hobby lobby trip I spotted a metallic poster board and I thought it would look even better. So I measured and cut the exact size I needed and modge podged it on to my finished art. I love how they came out. I ended up spending like a dollar on this because I already had most of the supplies. I love that I ventured out and tried bright colors. Our bedroom still needs some work for it to be completed (like outlet covers) but it's coming along nicely. Here is what the office nook looks like from a distance. I can't wait to show you guys our bedroom but in the meantime I will be sharing a couple more DIY's that I've been working on. You can find the first project I worked on for our bedroom here. 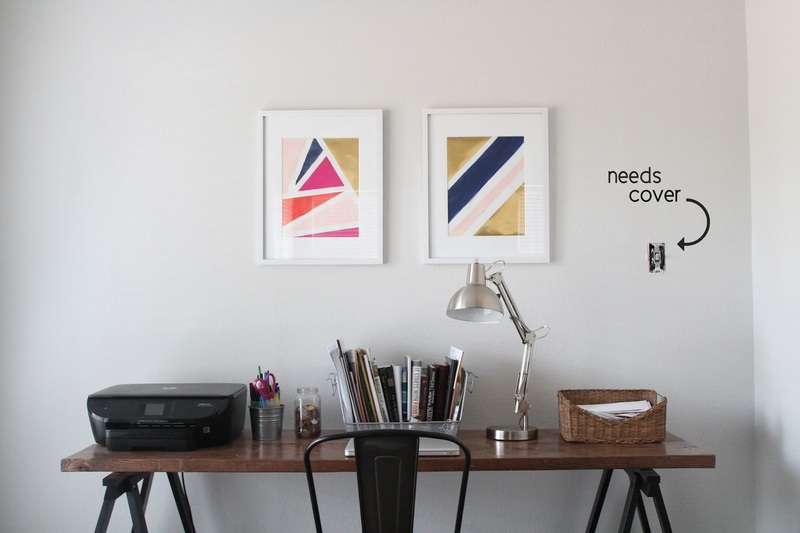 I love your desk and the pictures are perfect for the space! Very nice! I need some inexpensive canvas art for my daughters' room. This would be great! I also love the desk and how the office nook is coming along.